The first thing I want to mention in this article is our upcoming Districts 1 and 2 fall feast and veterans celebration 11 a.m.-2:30 p.m. Nov. 11 at Little Falls Presbyterian Church social hall, 6025 Little Falls Road, Arlington, Virginia. We will honor our veterans at the meeting. Please RSVP toll-free 1-888-741-5757 or 1-800-961-6988. Bring a dish to share and know you will be in the treasured company of fellow Potawatomi and our families. 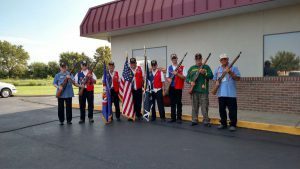 Rossville Color Guard members, left to right: Paul McGuire, Joseph Wulfkuhle, Lyman Boursaw, Jon Boursaw, Roy Slavin, Anthony Wulfkuhle, Mike Reid and Jack Wistos. The next thing I want to talk about is the Tall Corn Festival held Aug. 11-13 in Rossville, Kansas. There were many activities during the three days, including a parade down Main Street in which your Citizen Potawatomi Nation Color Guard participated. The flyer advertising the event listed Rossville points of interest, including the historic Joe Campbell Memorial Stadium and the Citizen Potawatomi Nation Regional Center. The historic stadium is dedicated to the memory of a Rossville baseball pioneer and features one of the oldest grandstands in the United States. A photo of the covered grandstand was featured in the July 1976 bicentennial issue of Sports Illustrated. Along with its signature grandstands, there is also a towering monster chain wall in right field. The Citizen Potawatomi Nation regional center opened May 4, 2005, in Rossville. The 9,000-square-foot building was constructed here because of the 3,500 tribal members in Kansas who live within 50 miles of the city. Some of Rossville’s streets, including Navarre Street, were named after tribal members. The tribe has more than 30,000 members nationwide; the center provides the option of 20 units of elder housing and is managed by CPN member Lyman Boursaw. I will close this column as always with a plea for your contact information. If you live in District 1 and do not get email or snail mail from me occasionally, it is because I do not have your contact information and due to privacy issues, the nation cannot provide me with that information. See my contact information earlier in this article.